New print revealed the Energy Bra. This bra is already in Canada and it's an H20 one. There is also a one piece swim suit in this print. Also shown are Lace Camo High Times in Alberta Lake. I think this tank is the Fast Lane Singlet. New Serene crops. I saw these in my store this weekend. 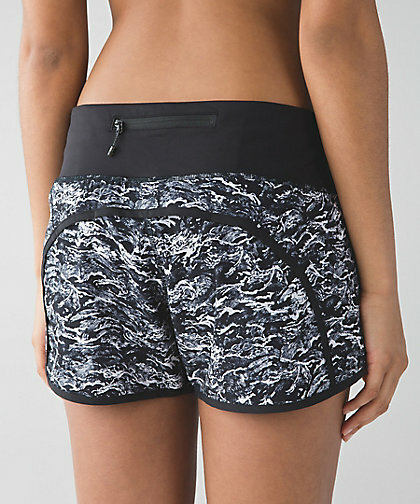 Canada has new Pace Rival crops in this print - Nami Wave. those crops are actually pretty cute, I might have to try them. Omg! Her upper body looks AMAZING! Oh wow that bra!! Is the H2O one still ok for regular workouts? I love the Serene crops and purchased them this week-end at my local Lulu! Anon 8:27 - I'm with you. The prints are so blah and repetitive. OMG she looks so fit! Inspiration! 11:48 there are some run stuff your bras in the WMTM. I got a pink one a few weeks back, now I have collected about 7 of those bad boys, they go like hot cakes. 3:36 - there are no Run Stuff Your Bra's on WMTM on the U.S. side. The Run Stuff Your Bra is the actual bra name and not a description of type of bra. They have the Rack Pack bra - it's not even close to the same fit as the Run Stuff Your Bra. 2 completely different fits and I hate the Rack Pack. 8:39 thanks for correcting me. I took a quick glance in the WMTM. I own both bras rack pack and stuff your bra and totally agree that the fit is different in both. I always go for my stuff your bra.